Should I Hire A Buyer's Agent? Should I Hire A Buyer's Agent? Should I hire a buyer’s agent or am I better off simply buying the property myself? Should you hire a buyer’s agent or should you go out on your own and invest on your own? Hey! I am Ryan from OnProperty.com.au and I wanted to do this episode to talk about this topic because I do believe there are a lot of people out there who a buyer’s agents could be useful for, that are not using buyer’s agents. And there are a lot of people out there who use buyer’s agents but maybe they should not be using buyer’s agents. So I just want to talk about this topic and to give you an idea of what a buyer’s agent does as well as help you assess whether or not you think a buyer’s agent is going to suit you. First, let us just talk about what is a buyer’s agent. A buyer’s agent is a person who works on your behalf to help you buy a property. They are not a real estate agent who is selling a property. They are actually someone who works on your behalf to go out there and to help you find a property. Ideally, a buyer’s agent should sit down with you first, understand your financial goals and help find areas that match up with your financial goals; and then properties within those areas that match up with your financial goals. So if you have a buyer’s agent and you say, “Look, I just want to gain some passive income. I just want a little bit, so I do not have that financial stress,” and that buyer’s agent says to you, “Well, you should actually invest in negatively geared property, it is not going to give you what you want, which is a passive income, but you are going to get all this capital growth and you are going to be rich in 3 years.” Well then, maybe you should run for the hills and you should choose another buyer’s agent. So ideally, a buyer’s agent should understand what you want and should be working to help get you what you want. So the first step towards using any buyer’s agent is to know what you want because if you do not know your own financial goals, if you do not know what you want, they will just point you in the direction that works for them. So go into it, hopefully they know what you want. They can find an area that you can find a property that suits you, and then they will go. They will inspect that property; they will look at that property. They will then come back to you and advise you, “If you want this property, here is what we suggest offering.” And they will do the negotiations with the real estate agent, and then basically you just need to organize your finances. You need to sign the forms and stuff like that, but they will deal with real estate agents, they will do all the negotiating, all of that sort of stuff. So a buyer’s agent works for you and is great for people who have some money to invest but are not investing for one reason or another. So that might be that you are time-poor. Look, we all have extremely busy lives. I run my own business. I have 3 kids. I know what it is like to be busy, and there are people out there who work in corporate jobs that are a lot busier than me. And so if someone is time-poor and you have the money to invest, you know what you want to achieve, you know you want to invest in property, but you have not invested because you just do not have the time or you do not have the head space to do it, then it may be worth looking for a buyer’s agent to help you out. Now, a buyer’s agent is going to cost you anywhere from around $5,000 at the absolute minimum to somewhere around $15,000 for properties maybe over $1 million. The buyer’s agent that I recommend is Ben. I think his fees are around $6,000 plus GST; so you are looking around that $7,000 to $10,000 mark for most buyers’ agent. Now this is money that you need to pay for yourself, so you can obviously lower your deposit and you can borrow that money from the bank but your deposit is getting less as a result. So it is not something that you can kind of just tack on to the purchase price of the property. It is something that you are going to need to pay for yourself. So in thinking about that, people who do not have a large deposit, which might only have a 5% deposit plus cost. Buyer’s agent probably not going to be for you because if you are going to need to spend $6,000 or $7,000 and that is going to get you to the point where you do not have a large enough deposit to purchase a property, then that is not going to work for you. So you really need to weigh up, is it going to be worth the cost in order to hire a buyer’s agent? I do not think this is necessarily true because if you are investing in a market where sellers are discounting their properties in order to sell them, then you basically have the same opportunity to get that discount yourself as long as you have some minor negotiating skills. You do not have to be awesome but you have to be decent. This would definitely work for people who are emotional buyers. And if you find a property that you absolutely love and you are willing to pay top dollar for because the curtains and the cupboard are perfect, then this could definitely work for you, and the buyer’s agent could get you a better discount. However, really I think the most important thing is to secure a good property in a good area at the right price. So getting an extra $5,000 or $7,000 or $10,000 in terms of discount should not be a top priority. It should be buying a good property in a good area with good prospects. And so the argument that a lot of buyer’s agents give that you will make your money back because they will get you a better discount, I do not think it is true. I think the value of a buyer’s agent, if you use a good buyer’s agent, is that they can help you identify the good areas to invest in. They can help you find good properties within those areas because they know the areas so well. And also, I think the main value of a buyer’s agent is that they can actually move you forward on your investment career. So if you are stuck, if for some reason you are not moving forward – whether it be time-poor or you are held back out of fear or often we just get overwhelmed because there are so much to know when buying a property, then a buyer’s agent could be good for you. When it comes to hiring a buyer’s agent, whether you think it is going to be right for you, I think for a lot of first-time buyers, a buyer’s agent is going to be really great. Investing in property for the first time is extremely overwhelming. It is very hard to know all the steps to take. However, once you invest in one or two properties, it becomes very straightforward after that because most property sales are really similar to the last property sale. So if you have done one, you have done two, you have basically done them all. Now obviously there are slight differences in everything, but once you have done a couple and you know what to do, then maybe you do not need a buyer’s agent anymore; if you know how to research an area, and you know how to find a property, and you know how to go through the process. So, let me try and collect these into a grandiose statement, who do I think should hire a buyer’s agent, who do I think should not? I think buyer’s agents are really useful for people who are stuck and who are not moving forward for one reason or another, and the reason they are not moving forward is money. So let us say, I think buyer’s agents are good for people who have the money to move forward but they find they are not moving forward for one reason or another. It might be they are time-poor. It might be that they do not have the head space. They might have family things going on. Maybe you do not know where to look. Maybe you are scared at investing. Maybe you are overwhelmed of the process. Maybe you have been stung in the past. There are so many different situations that can hold you back from moving forward, so if you find that you are stuck and you are not moving forward and money is not the problem; then you may want to consider looking at a buyer’s agent. However, on the flip side, of you do not have enough money or that is the reason you are not moving forward, buyer’s agent is not going to fix that problem. They are actually going to make that problem worse. So if you do not have enough money to form a deposit and to pay the cost and to invest in property, hiring a buyer’s agent is not going to fix that because they are going to charge you money which you are going to have to pay and that is going to put you even farther behind. So if your problem for not moving forward is you do not have enough money, then I would consider probably avoiding a buyer’s agent because there is no point. You need to have enough money to move forward, and you need to have extra money as well to pay for the buyer’s agent to move forward. As well, I think people who are extremely experienced in property, and who have specific things that they are looking for in property and you know how to do it, then maybe a buyer’s agent is just going to be overkill for you. If you really enjoy researching property, you enjoy looking at properties then chances are you are going to be able to find a bunch of great properties yourself especially if you have a good solid portfolio and you know what you are doing. However, I have seen many investors with good solid portfolios that are basically financially free already say, “Okay, I want to grow my portfolio,” but then they are back in a situation where they want to grow it, they have the money, they have the equity but they have not grown it for one reason or another, and so they are going to hire a buyer’s agent to give them that push and to give them that push forward. And so they might buy a couple of properties through a buyer’s agent and then stop for a couple of years, and then they might do some themselves; so they might go back to the buyer’s agent. 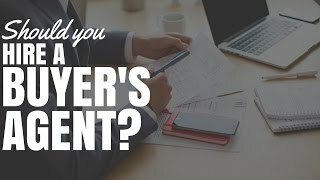 So whether you are a first-time investor or a really good investor, I guess when answering this question, “Should you hire a buyer’s agent?,” I think that if you are held back and the reason you are held back is not to do with money, then hiring a buyer’s agent to give you that extra push, to give you that help, to have someone kind of like an accountability partner that is like, “Okay, we are going to move forward. We are going to buy a property. We have this goal,” and they are going to do a lot of the work for you to move you towards that goal, then I think that can be worth $7,000 to $10,000 that you pay for. Also, if you are just really unsure and you do not know how to invest, then a buyer’s agent could be good for a first-time investor as well. If you really enjoy it and you are out there looking for property and you are finding them yourself; you do not need a buyer’s agent, you can negotiate yourself, you can research yourself, you can do all that stuff yourself. So if you are a self-starter, if you love doing all the research, then a buyer’s agent probably is not for you. And just to close this off, something that I want you guys to think about and something that I think about in my life, is to project forward in terms of 10 to 20 years. Where do you want to be, not just financially but in terms of the skill set that you have? so let us say we project 20 years into the future and we have bought 5 or 10 properties – let us call it 5, it is more realistic, and we have researched them all ourselves, we have purchased them all ourselves, how are we going to be financially versus whether we go through a buyer’s agent. We buy the same amount of properties – 5 properties, where are we going to be financially? I think if we are going to project forward with the help of a buyer’s agent, hopefully we will be in a better position financially than we would have been if we just did it ourselves. However, projecting forward as well, let us look at our skill set for the 2 properties. Using a buyer’s agent, we have not had to do the research ourselves. We have not had to inspect properties and look at all these properties and talk to real estate agents. We have not had to do these things and so we do not have that skill set. And so if we decide in 20 years’ time or 10 years’ time or whenever it may be, that I now want to explode my portfolio and I want to buy 20 properties in the next 5 years because I have the equity behind me to do that, well we do not actually have the skill set in order to achieve that. However, if we have done the investing ourselves, our skills set hopefully would have grown more than if we used someone else’s services. And so when we get to that future point in 20 years and we have 5 properties, we might not be in as good a financial position or we might be, you never know, but we have the skills set of researching areas, inspecting properties, maybe doing renovations and organizing finance, and all of these sort of stuff. So if we then decide, “Now, I want to explode my portfolio and buy 5 or 10 properties in the next 5 years, we have a stronger skills set in ourselves to go ahead and do that. The last consideration I want to leave with you when considering whether or not you should hire a buyer’s agent is what skills set you want to develop for your life down the track. For a lot of people, the skill set of investing in property is the one they want. Property is a means to an end. they just want to achieve some level of security or financial freedom so they could go and live their life and do other things. For other people, this is actually a process to get rich or a process to replace your income, something that you are interested in and passionate about and you want to learn about. In that case, you may want to invest the time to actually do the research yourself and inspect the properties yourself and stuff like that. So, I hope that this has given you some insight into whether or not you should hire a buyer’s agent. Sorry that this has been all around the place, but basically if you are held back and money is not the reason, a buyer’s agent maybe a good option for you. If you are a first-time investor and you are too overwhelmed and too scared, then a buyer’s agent might be good for you r first property, and then you can move on with the second property yourself. And then the last consideration we talked about is what sort of skills set do you want to have and if you want to build up these skills yourself for finding and investing in property, then you might want to do it yourself. However, if this is just a means to an end and you just want to achieve some lifestyle goals, and you do not need to build that skills set, then finding a good buyer’s agent might be a good strategy for you. So if you need help finding a good buyer’s agent, I do have a great one that I recommend, Ben Everingham from Pumped On Property. Just so you know, I do get a referral fee if you go to him and let him know that you came from On Property. No extra cost to you, I get that. Obviously, take this recommendation with a grain of salt. However this guy is financially free himself. He is a young gun, he is just 30 – I think he is. And he has already achieved financial freedom himself through his property portfolio and he is now helping other people invest in properties and to help them also achieve in financial freedom. And so I really like recommending him, not just because I get a referral fee, but because he really has the best interest of his customers at heart. And something that we have not talked about is that there are buyer’s agents and there are property marketers. And property marketers get commissions for the sale of new build developments. And so they pretend to be buddy-buddy with you and be your advisor, but really they are getting paid a commission for the sale of a new build property, so they have an incentive to sell new-build property whether it is good or not. Whereas a buyer’s agent gets paid directly from you, and so they have the incentive to help you so you come back to him. So with Ben, he is a buyer’s agent that gets paid by you, and he has really good ethics and really wants to help the people that come to him. I really appreciate working with him. I am really grateful to be able to recommend him and to just do life with this guy. So if you are looking for a good buyer’s agent, then Ben is offering On Property List, a free strategy session with him. Go ahead and sign up today if that is something you are interested in. Go ahead and request your free strategy session. Go to OnProperty.com/session and you can see all the details over there, and you can request a free strategy session over there. Again, that link is OnProperty.com.au/session. So that is it today, should you hire a buyer’s agent? Maybe you have listened to this and you thought, “Yeah. You know what, I am stuck and money is not the reason. So I might actually consider a buyer’s agent.” Or maybe you thought, “You know what, I actually want to be a successful property investor. And that is what I want to do with my life. I am not going to hire a buyer’s agent because I want to build up that skill set myself.” There is no right or wrong answer here. Whatever suits you. Whatever is going to get you towards your life goals as quickly as possible. Really. So I hope this has been helpful. Thanks for listening. Thanks so much for your attention and for the community that has come to On Property. I really love you guys. I love all the support that I have received from everyone. I really appreciate it.